No way! That is amazing that it got to 1 million even while I am away! Please tell the fans that I am loving it here and having some really wonderful experiences, and that I can’t thank them enough for the support that they’ve shown even while I’m away! A part of my heart is always with them. David Archuleta checked in from Dallas, Texas where he was for the Reebok 2011 Heroes celebrity baseball game. The pop star was singing ‘God Bless America’ for the event at the Dr. Pepper Ballpark. 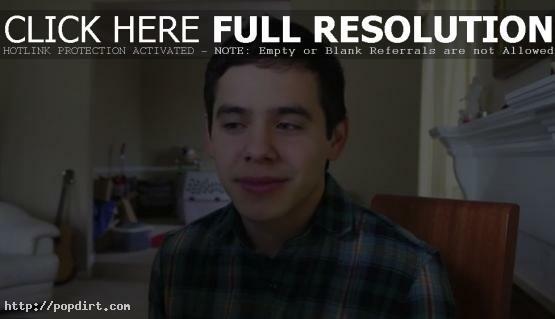 He talked about getting ready for Asia and his new website being up at DavidArchuleta.com. David also talked about checking out a Beyonce video online. David Archuleta checked in with fans on his YouTube channel on Thursday (June 9). The ‘American Idol’ alum talked about returning to Nashville, attending the prior night’s CMT Awards, doing a show in Myrtle Beach, South Carolina, meeting with writers and other meetings to get a feel for people and to make his music more meaningful. David Archuleta checked in with fans on his YouTube channel ahead of the season ten ‘American Idol’. The 20-year-old wished the best of luck to Lauren Alaina and Scotty McCreery, who like him made it to the final week while being under 18. David also talked about singing at the Dodgers game last week, the upcoming show this Saturday in Myrtle Beach, and a show in Manila, Philippines on July 18th. Watch it below. El Observador de Utah asked David Archuleta’s mother Lupita Archuleta how she felt to be the mother of the ‘American Idol’ season seven runner-up. “As parents, we sacrifice to give our children the best,” she said. “I love each of my children equally and admire their talents and individual characteristics. I feel very proud of David because his hard work and dedication have taken him to where he is now. His fame hasn’t gone to his head.” Lupita recently returned to the stage herself with a show at Club Karamba earlier this month in Salt Lake City. Read more. 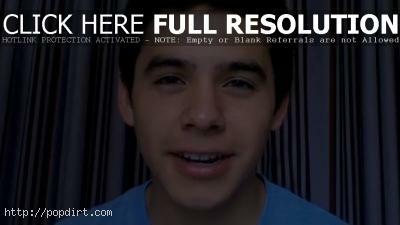 David Archuleta’s latest video clip features the pop singer going over what he’s been up to the last week. The Utah native attended the Prince concert, performed for Invisible Children’s Break the Silence in Nashville, went to the ASCAP expo, and went to the In-N-Out headquarters. “They have good morals and values and things,” the ‘American Idol’ said about the burger chain. “I really respected them for that and giving them props. They have good burgers. I don’t really eat fast food, but In-N-Out is definitely a place that is dear to my and my family’s hearts.” Watch the comments via YouTube below. David Archuleta’s latest video blog features the ‘American Idol’ alum talking about what he’s been up to, including the participation in a charity basketball game, before singing ‘Ribbon in the Sky’ by Stevie Wonder a capella. “Now I think I have plenty of witnesses to back me up on this that I can’t play basketball,” the singer confessed. “Not even if it was to save my life. But it was fun. I had a good time.” Watch the video via YouTube below. 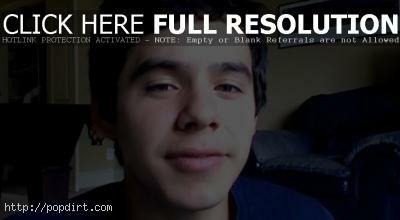 David Archuleta checked in with fans on his YouTube channel the other day after returning home to Utah. The ‘American Idol’ alum had been in meetings in Los Angeles mapping out the future and getting the foundation ready. David was also doing auditions to pick out a band. Now that he’s home, David said he’s begun working on new music. “I’ve been working on writing by myself,” David explained. “I’m trying not to work with as many collaborators. Not working with songwriters as much because I’m trying to find out what is David. Identifying that and identifying that sound. Trying to get to know myself in a way.” Watch the comments below. David Archuleta checked in from the Auto Club Speedway in Fontana ahead of his National Anthem performance at Saturday’s NASCAR Nationwide race. The ‘American Idol’ champ also talked about getting to ride in the Goodyear Blimp. “It was so awesome,” David said about his blimp ride. “It was one of the coolest things I’ve ever done in my life. I just want to say thank you again to Goodyear for being so cool. The people there are so nice. I was just really happy because it was one of my goals. I didn’t know if it would actually happen because it’s something you have to get invited to do.” Watch the comments below and watch his performance of ‘The Star Spangled Banner’ at the ‘Royal Purple 300’ at YouTube.